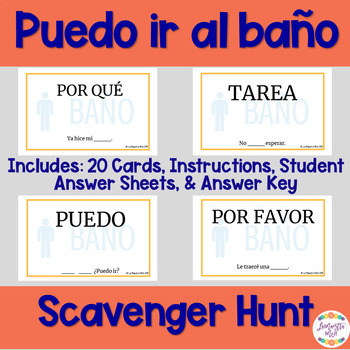 Get students moving and reinforce key vocabulary with this fun activity based on Señor Wooly's song, "Puedo ir al baño". Very little prep involved, just print, cut, and hang! The correct loop contains 14 answers. They include complete the lyric questions and 2 questions (e.g. ¿Quién fue al baño? Carlos). There are 6 "Try again" cards with incorrect answers to add more challenge to the activity. Want to simplify it? Leave the "Try again" cards out! Please click "Preview" to see what the cards look like. Please Note: You must have a Señor Wooly account in order to view the "Puedo ir al baño" story & extra materials. I am not affiliated with Señor Wooly LLC. I am just a huge fan and highly recommend getting a subscription to his amazing resources! Want to learn more about scavenger hunt activities? Check out my blog post here. Interested in a "No voy a levantarme" scavenger hunt? Click here!